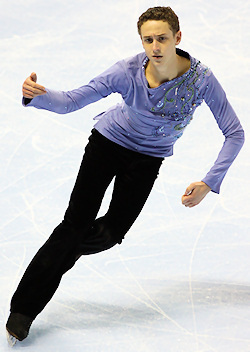 Mathieu Nepton is currently first after the Novice Men's Short Program at the 2011 BMO Junior Canadian Figure Skating Championships. After the short program, Mathieu Nepton of Québec leads the novice men. While Nepton’s section always has a large presence at the Canadian championships, his club does not—he is from Jonquière, far north of the popular training centers in Montréal. Nepton’s lyrical short program to Broken Sorrow featured a fantastic triple flip, which received +1 Grade of Execution (GOE) from seven judges, and a +2 from the remaining judge. With a total score of 44.42, his lead is just over two points. Christophe Belley, also of Québec, is sitting in second place (42.13). Belley struggled with his most difficult jump – a triple Lutz, but stayed on his feet through his Warsaw Concerto program. His triple loop-double toe loop combination and double Axel were solid. Alistair Sylvester (WO) skated in the first flight, but his score of 40.89 was enough for third at the end of the event. Since his toughest jump was a triple Salchow, his base value was a bit less than the top two competitors. However, he skated a clean, edgy program with a lot of flair, and two level four spins also kept him high in the standings. Two men from British Columbia, who share a last name, round out the top five. Mitchell Gordon is in fourth place, just .06 out of third place. He took a tumble on his triple Lutz, but recovered well and continued to fight through the rest of the program. Graeme Gordon (no relation) is in fifth with 38.03 points after a fantastic effort in his Santana short program. His solo triple toe loop gave him some trouble, but a step-out did not detract from one of the most entertaining programs of the event.